THE HOLIDAYS ARE IN FULL SWING, and whether this is your first holiday spent in Huntington Beach or your 10 + year, you&apos;ll discover there&apos;s so much to experience in Surf City USA during this time of year. 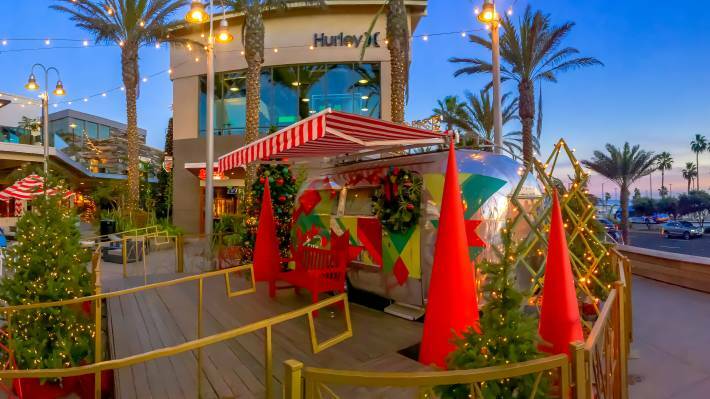 From the Huntington Harbour Boat Parade to the Kimpton Shorebreak Resort Miracle Bar, here are some of Huntington Beach locals favorite things to do during the holidays. Grab your sunglasses, hats, and iced venti peppermint latte, because it&apos;s time to experience the holidays, Surf City USA style. If you like to spike the eggnog while being in a North Pole bar environment, perhaps the Kimpton Shorebreak Resort Miracle Cocktail Bar is to your liking. This cocktail bar does not mess around when it comes to holiday spirt, cheer, and fancy holiday cocktail drinks. With kitschy holiday decor, professionally-developed cocktails and the nostalgic energy of the best office party you&apos;ve ever been to, Miracle is sure to get even the grouchiest grinch in the holiday spirit. The classical Huntington Harbour Boat Parade is lit and boat loads of fun. With dazzling boats, each having a specific theme, this is the perfect event to ring in the holidays with friends and family. Grab a drink and enjoy the Huntington Harbour Boat Parade. The show kicks off at 5:15 PM December 8 & 9 in the Huntington Beach Harbour. Click here for event details. Pawsibility the best holiday event yet. Leave your holiday stress at the doors, because it&apos;s time to play with puppies. Be a part of the ribbon cutting for Paséa Hotel & Spa&apos;s new interactive pup play park, The PAW-SÉA. Expect a 1,100 square foot outdoor pup play area outfitted with a lifeguard station dog house, local artist commissioned wall mural featuring dog angel wings for coveted Insta travel pics, and all the space a four-legged friend could want. It will be nothing but a pawesome time! Wear your holiday attire, come hungry, and get ready for sugar because the Holiday Cookie Crawl is pretty sweet. Wait...the fun doesn&apos;t end there. Enjoy your sweet treats while watching the Polar Express movie, showing on the big screen on level 2 of Pacific City. Dance your way into the New Year with the American Musician, DJ and producer ILLENIUM. He is known for his hit remix "Say It." And we&apos;re going to say it...this will be one epic beach party bash. The Cruise of Lights in the Huntington Harbour is nothing but lit and here are the three ways you can experience it. However you do it, you&apos;ll be treated to beautiful holiday lights and decorations that will get you in the holiday spirit. More event information click here. Grab some friends and freeze your jingle bells off to Surf City USA&apos;s annual New Years event, Surf City Splash. If you&apos;re thinking wetsuits already...stop right there because that&apos;s cheating! Expect the Pacific Ocean to be 50 (ish) degrees on January 1st with people screaming into the New Year. The big splash into the ocean takes place at noon after the pancake breakfast. Registration is $25.00. All proceeds benefit the International Surfing Museum. Click here to register. Well if you didn&apos;t watch a classical holiday movie, did the holidays even happen? Bring your blanket, friends and family to watch classic holiday movies at Pacific City. Join Pacific City at the big screen on the Second Level each Wednesday this holiday season! These movie nights are FREE and fun for the whole family! But before watching the movie, make sure you take an Elfie with your group and tag @SurfCityUSA. Celebrate good times, come on! Ring in the New Year with Kool & the Gang at the Hyatt Regency Huntington Beach Resort & Spa. Here&apos;s everything you need to know to celebrate with these guys. To top off your holidays, your dog and your family are invited to a holiday pawty. The Santa Paws event pawty is happening Saturday Dec 8th 12 - 3 PM on 5th & PCH. Don’t miss out on the food samplings, dog adoptions and vendor booths, and a chance to say hi to Santa and Mrs. Clause. 5th & PCH are proudly partnering with Waggin’ Trails Rescue Foundation, so come join the fun!